SIGN THIS PETITION to ask Governor Ralph Northam to fight voter suppression and end the use of CROSSCHECK in Virginia. It’s a voluntary program Virginia participates in which is used to support voter suppression efforts throughout the country. The program's original purpose was to identify voters who relocate out of state to clean-up voter rolls. As part of this program, Virginia sends all voter registration data to Kansas, including the last four digits of your social security number! The system is known to return many false matches on voters in other states, claiming different people are in fact the same person. States have misused this data and have illegally cancelled THOUSANDS of legitimate voters. 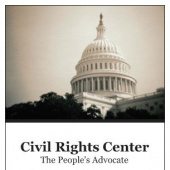 By participating in this program, we are contributing to a national voter suppression program. This system unfairly targets people of color. People with common last names are more likely to show up as matches in this system. Census data shows that people of color are more likely to share common last names; therefore, people of color - think Martinez, Washington, Kim - are more likely to end up on Crosscheck lists and purged. Kris Kobach manages this program. He is the current Kansas Secretary of State and has known white nationalist ties. He has a long history of discriminatory policies and is a paid contributor to Breitbart. Kobach has repeatedly used misleading Crosscheck statistics to lie about the extent of voter fraud. He lies, to justify creating new laws that make it harder for people to vote. There is a better, more secure system available. It's called ERIC. In addition to producing more accurate results, ERIC helps states identify people who aren’t yet registered to vote and encourages them to do so. Edgardo Cortez, The Virginia Election Commissioner is also the Chairman of ERIC. Cortez has stated that the primary reason to stay in Crosscheck is that many neighboring states are in Crosscheck, but not ERIC. 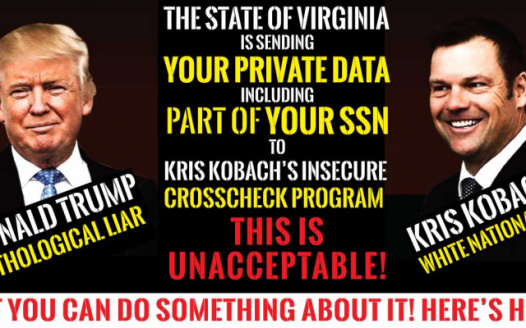 If Virginia wants to encourage other states to join ERIC, there’s no better way to do so than to pull our data out of Crosscheck and force them all to join ERIC to get it. SIGN THIS PETITION and call on Governor McAuliffe to fight voter suppression and end the use of CROSSCHECK in Virginia!